What is Active(1) and Active(unlimited)? If you are a current customer you have probably noticed “Active (1)” and “Active (unlimited)” show up in the status column of the list of students in your account. No, this is not an attempt to confuse you or keep you guessing. 2 credits = unlimited grading for one student for one month. We are starting with a student account that has a status of “Idle”. This means you have just created a new account or you haven’t graded any tests for that student in over a month. Under the credits-based billing, we do not charge you anything for a student with a status of “Idle”. It’s Aug 18, and you grade a test for that student (either by processing the scanned paper bubble sheet, or by the student completing an online answer sheet, or you manually entering the student’s answers) – we charge you 1 credit. The student’s status changes from “Idle” to “Active (1)”. On Aug 20 you grade a second test for that student. We charge you 1 additional credit. The student’s status changes from “Active (1)” to “Active (unlimited)”. You can now grade an unlimited number of additional tests for that student until Sep 17 without incurring any additional charges. On Sep 18, the student’s status changes from “Active (unlimited)” to “Idle” and remains in that status until you grade another test. At that point the above process repeats itself. Is that clear as mud? I hope it’s a lot clearer. The process happens automatically. You do not have to manage student statuses. You can see a history of the credits we’ve charged you through Tools-Credits. This new 1-2 credit scheme started Aug 21. So any credit history before would be for the old scheme. Probably a bit confusing at the moment, but hopefully it will get a lot clearer as we move forward and the history fills up with Active (1) and Active (unlimited) entries. And yes, you are probably wondering how we handle credits you’ve already purchased as you now need 2 credits to get unlimited test grading for one student for one month instead of 1. We’ve credited your account with the number of credits you currently have plus any credits you’ve used in the past month. And yes, the price per credit has been reduced by half (or in some cases a little more than half). We hope this makes the billing much easier to understand. No more … (I won’t attempt to give a quick summary of how we wanted to handle one-off discounted diagnostic tests)… just a simple 1 credit = 1 test, 2 credits = unlimited test grading for one student for one month. Customers who have not switched to the new credits-based billing system, will see the new statuses and will be able to track their hypothetical credit usage under Tools – Credits. But you will continue to be billed for all student accounts that are not ‘archived/locked’. And finally… right now is a good time to buy some extra credits. We have a ‘back to school’ special going on where you can purchase 40 credits for $40. That’s 40 tests for $40 or grading an unlimited number of tests for 20 students for one full month. This offer expires Oct 1, 2017. We are currently working on the ability for students to take a complete timed tests with predetermined breaks through their student portal – and after that it’s finally your ability to send email notifications to students when a test is graded. By Joerg Weser|2017-08-22T11:08:08-06:00August 22nd, 2017|BubbleScan|Comments Off on What is Active(1) and Active(unlimited)? We’ve added the answer key for CollegeBoard’s May 2017 (5MSA12) test to our library. The default answer key / test ID that your students will need to bubble in is #69. 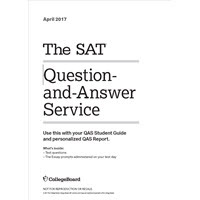 We’ve added the answer key for CollegeBoard’s Apr 2017 test to our library. The default answer key / test ID that your students will need to bubble in is #68. 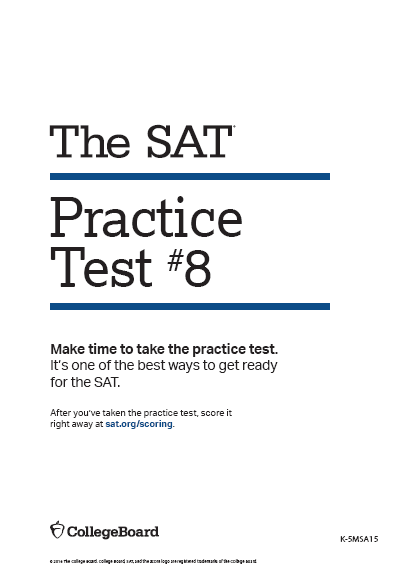 The premium answer key for SAT Practice Test #8 from CollegeBoard is now available. A premium key is one where we have mapped every question to one of our custom categories, such as “Words in Context: Meaning” or “Heart or Algebra: Create Equations”. An analysis of how a student did within each category is printed on pages 2 and 3 of the student report. All customers can easily create their own list of custom categories and then map each question of a given answer key to one of those categories. This is a standard feature and many of our tutoring customers rightfully take pride in the value their custom question mapping provides to their students. For tutors who don’t want to take the time to do this, we offer our ‘premium answer keys’ where this mapping has been done. We offer premium keys for all 8 of CollegeBoard’s SAT Practice tests. Customers who pay for their OnlineScoreTracker usage with ‘credits’ will receive this upgrade at no charge. For customers under a previous billing plan we will install each premium key for only $45. Once installed you can make use of the key forever. Please contact us to request one (or all 8) of the answer keys. We just added the answer key for ACT 74C from June 2017 to our database. We’ve also updated the answer key for ACT 74F (Apr 2017), which before was missing the reporting categories. Browse to the csv file you previously downloaded and upload it to your account.